This instrument is made up of three superimposed disks of different diameters. The disks are marked with inscriptions indicating the days, months and signs of the zodiac, suitably placed so that when the polar star is sighted through the central hole and the alidade is pointed in the direction of a star, it was possible to find the time at night. 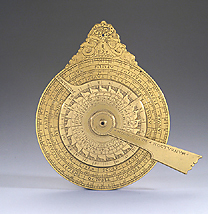 On the back of the instrument the hour lines and the quadrant are inscribed, allowing the instrument to be used as a sundial and as an aid in measuring heights and distances. The instrument is unsigned but is probably the work of Girolamo della Volpaia, the son of Camillo, and a maker of observational and measuring instruments working for the Medici dynasty.